The Tasman Sea Low is expected to bring periods of heavy rain for the north and west of the South Island from today (Tuesday 11/04/17), then spreading to Otago early Wednesday morning and to the North Island later Wednesday. Check out all the details in the latest warnings http://bit.ly/AllWarnings. The Tasman Sea Low will bring heavy rain to New Zealand, along with the potential for flooding for the upper North Island in particular. 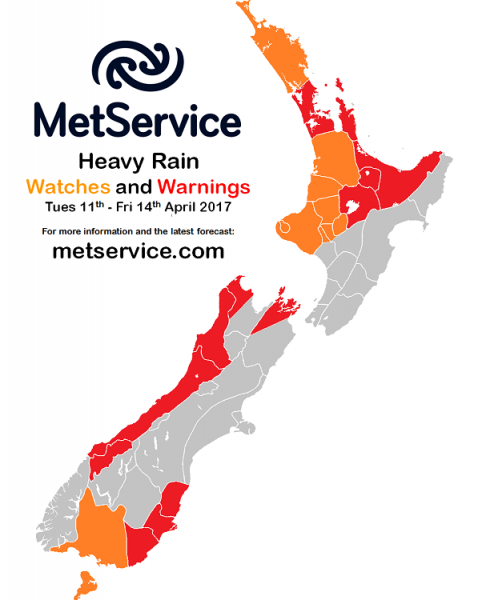 After severe flooding in Bay of Plenty last week, they are again looking to be one of the worst hit areas, with 200 – 250 mm of rain expected to fall over 48 hours from midday Wednesday 12/04/17 to midday Friday 14/04/17. To complicate matters, Cyclone Cook is likely to affect parts of New Zealand at the end of the week, which may prolong the rainfall in these already sodden areas. Tropical Cyclone Cook was located just south of New Caledonia as of 1pm Tuesday 11/04/17, and is expected to track south-southeast. As it passes latitude 25 degrees south, Cook will move into MetService’s area of responsibility as the official Tropical Cyclone Warning Centre for this region (more information about the Wellington Tropical Cyclone Warning Centre can be found on our website: Tropical Cyclone Monitoring. Tropical Cyclone Cook is then expected to transition into a mid-latitude low, remaining a significant weather system with strong winds and heavy rain. You can read more about extra tropical cyclones at this blog: Tropical cyclones: extra-tropical transition. Tropical Cyclone Cook will then become simply “Cyclone Cook” and, although it will no longer be a TC, it could still bring damaging winds, and prolong the heavy rain over the upper North Island. The highlighted area over New Zealand shows the spread of where could possibly be affected by this event. 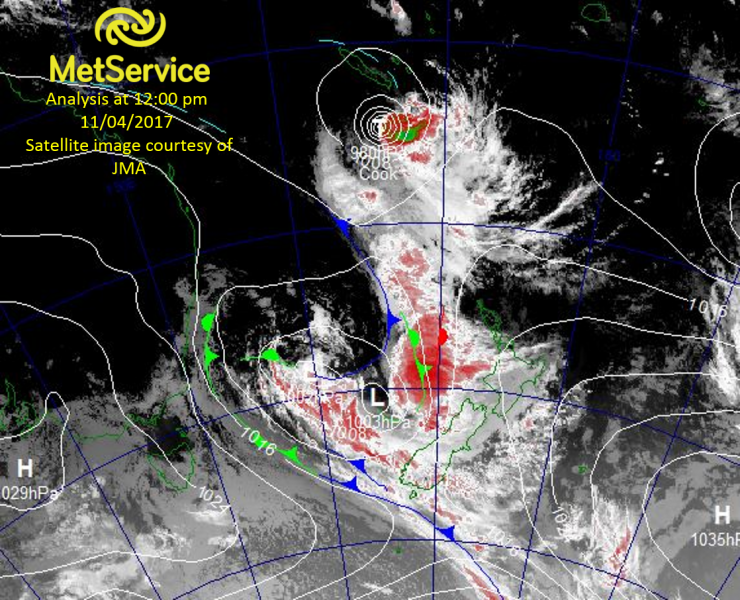 Cyclone Cook is expected to whip up heavy northeast swells on Thursday from Cape Reinga across to East Cape and down to Hawkes Bay. Then the heavy seas are expected to spread all the way down the east coast from Hawkes Bay to Stewart Island on Friday. 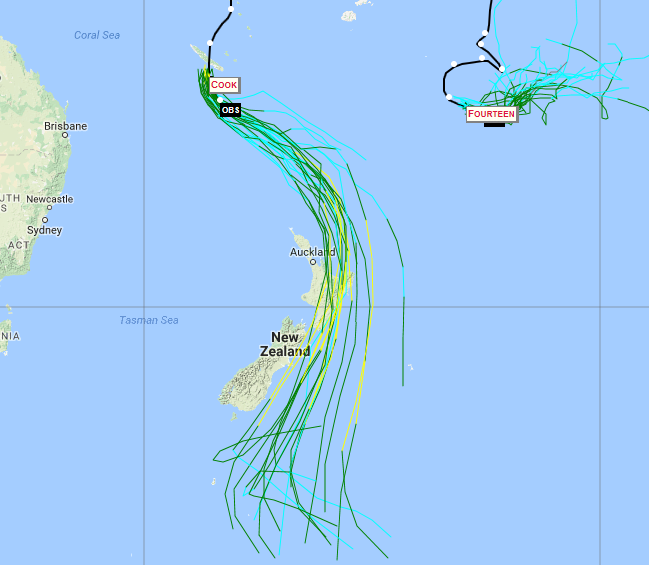 While it is likely that parts of New Zealand will see some effects from Cyclone Cook at the end of the week, there is still some uncertainty regarding the exact path that the cyclone will take. This will affect which areas will receive the heaviest rain and strongest winds. The image below shows a range of possible tracks for Cyclone Cook. More information will become available with each passing day, and MetService forecasters will be working tirelessly to keep the public and emergency management up to date. (Image courtesy of NOAA Earth System Research Laboratory https://ruc.noaa.gov/tracks/ , using data from the UKMO weather model). While there are already plenty of Severe Weather Watches and Warnings in place thanks to the Tasman Sea low, it is likely that further areas will be added as Cyclone Cook nears New Zealand. With many people heading away for the Easter break, MetService advises people to keep up to date with the latest Watches and Warnings on the MetService website, as well as checking the NZTA website for road conditions and possible closures. Edits by Meteorologist Lisa Murray and Claire Flynn.